In the following picture, you can see the structure of boards and committees at the School of Business and Economics (Fachbereich Wirtschaftswissenschaften). 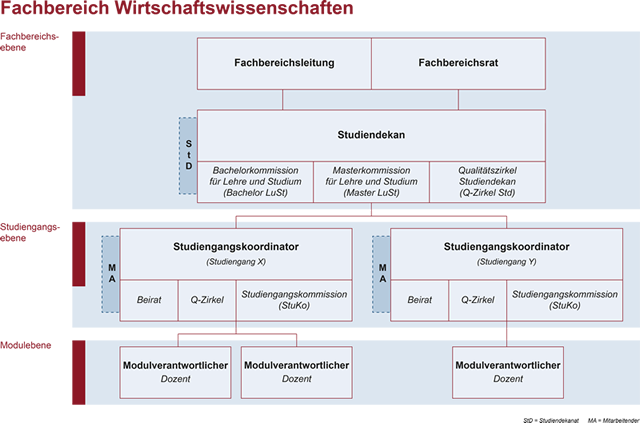 Below you can find a description of boards and committees at the level of our course of study (Studiengangsebene). The Head of the IIS program, Prof. Dr. Bodendorf, is responsible for the coordination and advancement of the course of study. He is supported by his research assistants and IIS study coordinators Pavlina Kröckel and Isabella Eigner. The Head of the study program, the study coordinators, the professors responsible for the different modules, their research assistants as well as student representatives of each year participate in the Studiengangskommission. The Studiengangskommission exchanges recent information, discusses current problems. and derives measures to resolve these problems. Receiving input from the Quality Circle and the Beirat, the Studiengangskommission makes strategically relevant decisions in order to advance the course of studies. Click here for an overview of the members of the Studiengangskommission. The Quality Circle provides direct information exchange regarding the course of study between the Study, his assistants and students of each year. The objective is to identify and resolve weaknesses as early as possible. The Quality Circle takes place once a month. An overview of the members is given here. Fostering the exchange with representatives from companies and academia, the Beirat is an advisory board developing ideas for the strategic advancement of the course of study. It consists of the Studiengangskoordinator, his assistants, student representatives as well as external representatives and alumni. The list of members can be accessed here. For further information please visit Strukturen im Qualitätsmanagement am Fachbereich Wirtschaftswissenschaften (www.wiwiq.rw.fau.de).